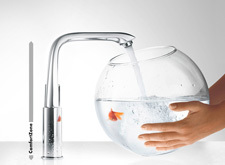 Has your customer fallen in love with a mixer, but is unsure whether it really goes with his/her wash basin? 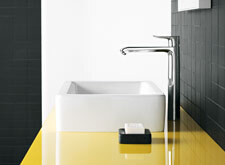 Would he/she like to know which mixers from the hansgrohe and AXOR brands go with which wash basins? Mixer-wash basin combination: we can assist you and your customers in your mutual search for the perfect combination. With stylish suggestions – technologically tested at our test centre – for hansgrohe brand products, and with design recommendations for AXOR brand products. Splash test: the bathroom professionals at the Hansgrohe test centre have tested and evaluated lots of different mixer-wash basin combinations for you. We have made the results available to you free of charge. Which mixer goes with which wash basin, and in which home? In conjunction with the right wash basin, our “Modern” style mixers are on top form, both aesthetically and in terms of functionality. Use our online Configurator to find the perfect matching pair for your customer. Use our ambience recommendations to navigate visually. How many Metris, Talis and Focus mixers are there, at what height and what added convenience do they offer? Whether your customers would like to be able to wash their hair in comfort in the wash basin or be able to move around more freely when wet-shaving: give your customers the space that they need in the bathroom.